Ephemeral – lasting a very short time. It took me six years of hard slog study to achieve my Open University degree at the age of 58. To say I was chuffed to have passed would be the understatement of the century. I know, I know, most people manage to get theirs in their early twenties, but better late than never eh? Anyhoo, you may be wondering why I’ve been rambling about that as something ‘ephemeral’, when clearly the process was quite the opposite. Well… just like any other graduates, OU students are presented with their qualifications at a big glittery award. The ceremony I attended was at the famous Barbican Centre in London. My husband and daughters had come along to watch and be proud, and I was beyond excited. 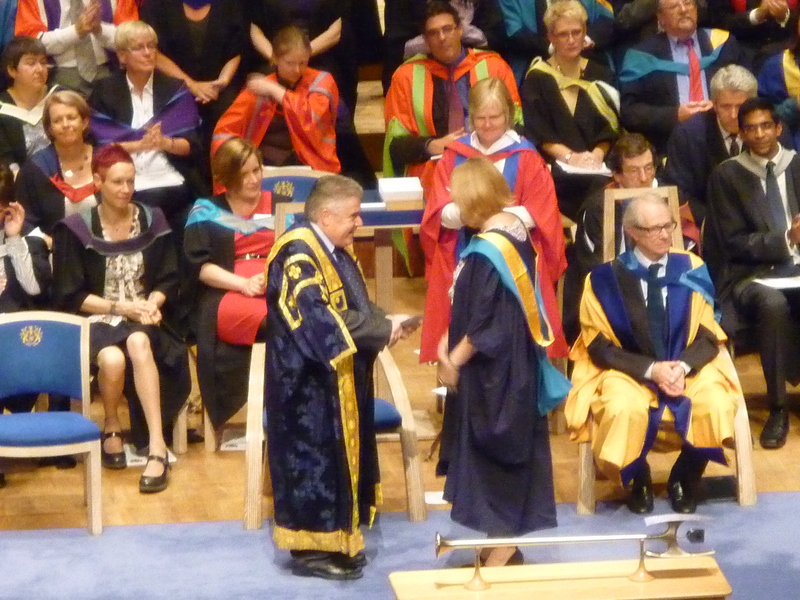 The event itself took a couple of hours, but prior to it, there was the thrill of getting my robe fitted (disappointingly the OU students don’t get to wear mortar boards though) and getting formal pictures taken. Then the nervous wait for my turn. I’m sure most of you will know that these ceremonies are basically a long procession of students walking across the stage, shaking hands, taking their awards and walking off again. It’s like watching paint dry when it’s not one of your own. However, when it’s your turn, or the turn of someone you love, it really is a top couple of minutes. I remember it exactly. The tip tap of my shoes on the polished wood, the clapping and cheering from the audience (they managed to keep it up for every single person), the brief exchange of words, and the exit, all of which I managed without falling over or generally making a fool of myself (and there were stairs, I hope you’re impressed!) It was indeed a very fleeting moment in the scheme of things, but one which meant so much and has made an indelible imprint on my mind. This entry was posted in Photo Challenges, Ramblings and tagged Ceremony, Degree, dpchallenge, ephemeral, family, life, Open University, OU, pride. Bookmark the permalink. ← Bores? I don’t think so! You have a hood on your robe…that means a Masters degree here. Way more than most 20-somethings ever accomplish. I never did – just a Bachelors. Good for you! Nah, not a hood and not Masters, just a BA! Well, it looks like a hood. 2 of my 4 kids have achieved a BA. 1 has an MA. The younger 2 decided it wasn’t worth the student loan debt these days. Maybe later in their lives they’ll go back, when they figure out what would be worth the trouble. Higher education is rather a mess here in the States. Congratulations on your degree! This was an excellent illustration of an ephemeral moment with a major impact! Thanks Ruchi! It was four or five years ago now but still a wonderful and vivid memory! !